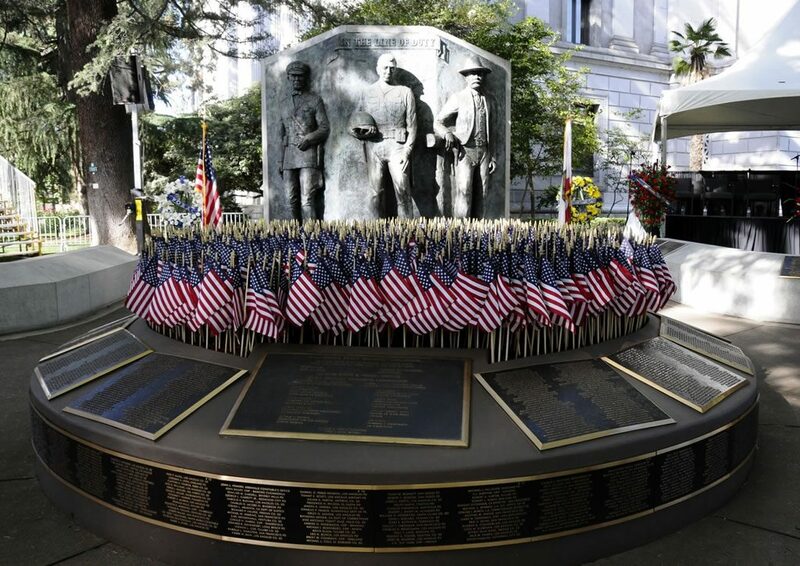 California Peace Officers’ Memorial Ceremonies have been conducted in the State Capitol since 1977. 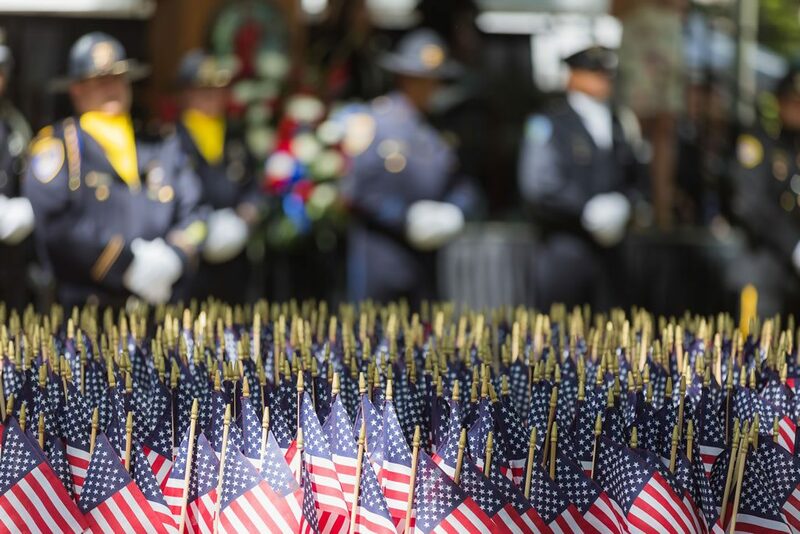 It is a ceremony that honors the officers who have fallen in the line-of-duty the preceding year, recognizing the sacrifice of those loved and left behind. We understand that the grief of the loss still lingers on, and such proceedings renew unhappy memories and can be the occasion of additional pain. However, it is important that those of us left behind, recognize that these officers did not die in vain. The people owe a debt to those who have given their lives, and the peace officers of this state want this memory to stay fresh in the minds of the citizens. That is why we must revisit these unhappy memories each year on that day set aside to reflect on courage and sacrifice; and, to assure that their loss will not be forgotten, and the survivors will always be a part of the police community. Is it the wood and glass-encased book of fallen officers’ names, attached to the wall just outside the governor’s office? Is it the 13- foot, three-figured bronze monument in Capitol Park at 10th Street and Capitol Mall? Or is it the sense of loss when a law enforcement family buries one of its members? In 1976, a small group of peace officers felt the need to create a remembrance for their fallen comrades. With the signing of SCR94 (Senator Robert Presley), by then-Governor Jerry Brown, the dream of memorializing the fallen peace officer came true. These peace officers then went to work raising funds and formulating ideas for a memorial. 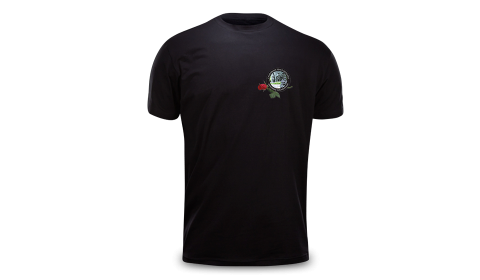 The ideas became the memorial case, the leather-bound book of names, and the two hand crafted swords that symbolized the spartan warrior and the keeper of the peace. For the ten years that followed, the PORAC Memorial Committee, as provided for by the Presley legislation, gathered the “police family” at the State Capitol to rededicate the memorial. This committee became the caretaker of the California memorial, taking great pains to insure that the names of the dead officers submitted by their respective departments, were included in the memorial book, as well as the hearts of every Californian. The establishment of a nine-member California Peace Officers’ Commission from this legislation developed into a new chapter in the memorial story. The commission consisted of eight peace officers and a police widow: Richard Moore, chief of Atherton P.D. ; Phil Jordan, an officer with Vallejo P.D. ; were elected chairman and vice-chairman respectfully; Lt. George Aliano, Los Angeles Police Protective League, secretary; Bob Applegate, California Assn. of Highway Patrolmen, treasurer; other commissioners were Sgt. Jim Vogts, State Marshals Assn. ; San Diego Sheriff John Duffy; Deputy Art Brown, Assn. for Los Angeles Deputy Sheriff’s; Mrs. Sammy Hoyt, widow of Lake County Deputy Sheriff and past PORAC president, Dave Hoyt; and Senior Officer Gil Coerper, Huntington Beach P.O.A. The Executive Director, by a unanimous decision, was Al LeBas, retired division chief with the Los Angeles County Sheriff’s Dept. and law enforcement liaison for Governor Deukmejian. 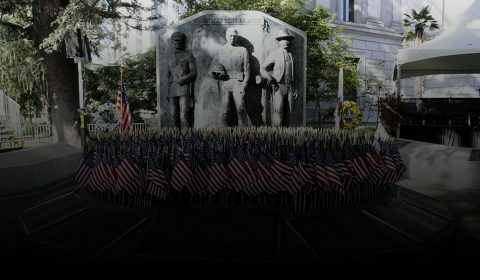 From around the state, hundreds of the cities’, counties’ and states’ finest were gathered at 2:30 p.m. on Tuesday, May 13, 1988, for the dedication ceremony when Governor George Deukmejian released the cover from atop the California Peace Officers’ Memorial Monument. They stared at the three figures looking out into the grassy, tree-lined park. As the brick planter that contains individual plaques bearing the names of fallen peace officers was unveiled, the pride and sense of honor emerged from everyone present and was almost overwhelming. As families, friends and many peace officers began to push forward with the hope of getting a closer look, some had smiles, some had tears, while others just stood and stared. At that moment, all of California had their memorial to honor their keepers of the peace. 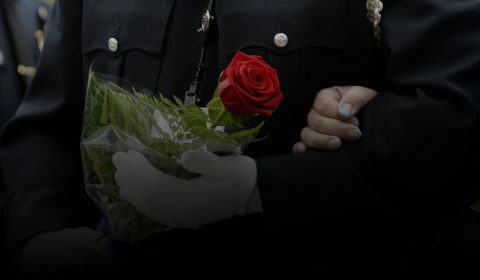 Almost everyone felt the urge to reach out and touch a leg, shoe or hand of the three- figured statue, or woman and child sitting on the park bench a few feet away, or touch the name of a fallen officer, on the walk of honor. “We pledge our best efforts to stand behind the men and women who stand behind the badge,” said Gov. Deukmejian in dedicating the memorial.